The section below covers our customer’s most frequently asked questions, based on over 40,000 service calls. What does a boiler service comprise of? H how often should my boiler be serviced? Which, out of the different types of gas boiler repair companies that are out there, should I be looking at - to achieve a prompt and correctly priced repair for my faulty/broken combi boiler? First, check out your boiler manufacturer’s own service team. They will offer expert service and repair for all of their own boiler’s makes and models. You might also consider using the manufacturer’s approved boiler/furnace service agent for your area. Alternatively you could try to locate an independent repair specialist for your boiler type. Hopefully it shouldn’t be too difficult to find one that covers your area. Another good reason to consider the three mentioned above first, is that the manufacturer, the agent and the specialist will all have real expert knowledge and know-how of your exact boiler model. Of equal importance is that they should all carry full van stocks with the required parts to achieve a quality, first time repair. All parts don’t fit all boilers! There’s something else that is important about the parts inside your boiler, that when fully understood could be of real help to you – when trying to select the best boiler repair company to use. These days almost all modern gas boilers contain unique parts inside! This means that your boiler’s parts will almost certainly only fit your specific model. If you’ve developed a major fault on your gas boiler, e.g. a F13, “blown printed circuit board” (PCB), or a burned out fan, or a stuck or jammed pump showing F75, (i.e. not a small fault e.g. pressure dropping), then unique parts will be needed. These parts will only fit on your particular make and model of boiler! Really, AND THIS IS THE KEY, pretty much only the manufacturer, the agent, and the dedicated specialist would carry these unique parts with them as van stock, enabling a quick repair to be completed. Our company carry between 30-40 different printed circuit boards (PCBs), believe it or not. This is just to cover the boilers that we specialise in, which in our case is Vaillant, Glow-worm and Saunier Duval. It’s that specific! And also, it’s not just the condensing boilers from the last 7 or 8 years or so, which have unique parts in them. Going back to the “fan flued” combies of the eighties, they also pretty much were all made with unique parts as well. To be fair, some of the much older cast iron boilers (not that many left now), did use some parts that were interchangeable with other boilers, e.g. universal thermocouples and some older gas valves etc. Large national service companies – what’s to consider? If you are thinking of using one of the large national boiler repair companies to carry out your boiler repair, then be sure to ask a couple of questions first, before deciding on which, if any, you should use. Firstly, try to get assurances that their engineer will have good working knowledge and understanding of your particular make and model of boiler. Secondly, get them to confirm that the service engineer who attends, carries the specific parts for your exact combi or system boiler. This should ensure that they will be able to get you up and running again, in just one visit. If you are thinking of going for one of the large nationals, that’s fine but remember that they may not specialise in your make of boiler! If you stop and think about it for a moment, the national companies have to attend and repair every conceivable make and model of wall hung or floor standing gas boiler that exists. Starting from A for Alpha boilers, right through to V for Vokera boilers, including all others in-between. These big national firms could easily attend breakdowns for 60 or 70 different manufacturer’s boilers, most having unique parts? So, find out who’s attending and what parts they are bringing! Where you live, it might well be that there is indeed a very good, Gas Safe Registered, service engineer that you could use. Nowadays there are many service engineers and gas installers who have attended and completed one of the very useful “Factory Training Courses” put on by leading boiler companies. These are provided for engineers and installers who want to gain more specific knowledge of the boilers that they work on, or fit. It could also be the case that the installer who fitted your boiler (if it was installed not so long ago), is one of the growing group of independent installers who are loyal to only one manufacturer. For example, if they fitted Vaillant boilers, they would be called “Vaillant Advanced Installers”, i.e. installers who only install one manufacturer’s boiler, no others. This type of advanced installer may well be quite conversant (for repairs) with the brand that they install. This is definitely worth looking into. We have a Faulty Vaillant ecoTEC boiler which has now stopped working altogether and is flashing up an F.75 fault code on the small display screen. Do you know what causes this fault code and what needs to be done to fix the problem? Low system water pressure, where the needle points down to zero (no pressure) on the boiler’s gauge or display, may be the cause of an F.75 fault code being displayed on the boiler, if the water pressure is a bit on the low side, ( but it is much more likely to be either the Pressure sensor or Pump ). ecoTEC plus: The boiler can be repressurised by opening the two “filling taps”, which are situated on the underneath of the boiler. This will then allow the boiler to start repressurising back up to 1.0 bar, following this procedure the taps will need to be closed again. If water starts leaking out from the boiler during repressurisation, stop refilling immediately and have the cause of the leak investigated. Once the boiler has been repressurised back up to 1.0 bar, press the reset button on the boiler (top left of the four buttons below the display) to restart the boiler. ecoTEC pro: The boiler can be repressurised by locating the filling loop (not part of the boiler), which is usually a flexible silver pipe. This will need to be connected (if it is not already connected) to the system pipework for repressurising to take place. Once the flexible filling loop has been attached to the system pipework, the valve on the filling loop will need to be opened, this will cause the boiler to begin repressurising. Once 1.0 bar pressure has been reached, the tap on the filling loop needs to be closed and the flexible filling loop disconnected (if required by local/national water regulations). Once this has been done, the reset button on the boiler (top left of the four buttons below the display) needs to be pressed to restart the boiler. The F.75 fault can also be caused if the boiler’s integral pump has failed or becomes seized (possibly due to dirty system water). This results in water not circulating from the boiler to the radiators. The boiler pump may need replacing, if this is the case, the system water should be cleaned and treated before a replacement pump is fitted. This work should only be carried out by a Gas Safe registered engineer or installer. The boiler’s “low water pressure sensor” becoming faulty can bring up an F.75 fault code. This is a result of the pressure sensor not detecting a slight rise in the water pressure when the pump starts operating (possibly due to dirty system water). Replacing the low water system pressure sensor should only be carried out by a Gas Safe registered engineer or installer. Why does the pressure keep dropping down from 1.0 bar to zero every day, on our combi boiler’s pressure gauge, causing it not to work again until we repressurise it? We have checked thoroughly for leaks on the heating pipework (as we were told to do), but cannot find any leaks anywhere. What else could be causing this daily pressure loss? A few customers unfortunately experience this annoying problem, where the boiler’s pressure gauge drops down to zero every day. This unexplained loss of pressure can sometimes be caused by a leak on the heating system’s pipework or radiator valve connections. However, we almost always find that the route cause of these pressure dropping problems is a fault within the boiler’s integral expansion vessel. Due to lower than average winter temperatures in recent years, many gas boiler expansion vessels (which are inside or mounted on the back of the boiler) have become significantly deflated. We usually find that if pressure fluctuations occur on a daily basis, a deflated boiler expansion vessel diaphragm is the main cause. Note – this problem can (rarely) be caused by a blocked vessel connecting tube. To achieve a good and lasting repair to the vessel a precise procedure is required. This needs to be carried out by someone who is experienced in successfully pumping up expansion vessels, therefore avoiding the unnecessary expense of replacing parts. This work should only be carried out by a gas safe registered engineer or installer. Why does our Vaillant ecoTEC boiler sometimes fires up, even though the heating is switched off? The most likely reason for a Vaillant ecoTEC Pro or Plus boiler to occasionally fire up when the heating is switched off, is that the boiler’s built-in hot water pre-heat facility (“Warmstart”) is activated. When the warmstart system is selected, it is possible that you will hear your Vaillant boiler firing up for a few seconds once or twice each hour. The boiler does this to maintain a stored amount of preheated water, so that when a tap is opened, hot water is immediately available. Activation of the warmstart system for the ecoTEC Plus, is achieved by turning the top hot water control knob, in the clockwise direction, until it stops turning. The “C” symbol should now appear (flashing at first), then staying permanently on the display unit. This indicates that warmstart is now switched on/activated. To switch off warmstart, turn the hot water control knob back in the anti-clockwise direction, all the way around until it stops turning. Warmstart should now deactivate/switch off, and after a short time the “C” symbol will disappear from the display. To set the desired hot water temperature, the hot water control knob will need to be turned in the clockwise direction, but keeping short of turning all the way around to the end (as this would switch warmstart back on). To switch the ecoTEC Pro warmstart system on, turn the top hot water control knob fully in the clockwise direction, all the way around until it stops turning. On the boiler’s display, the green LED will light up and stay on, this means that the boiler’s warmstart system is now activated/switched on. To deactivate/switch off warmstart, turn the “top” hot water control knob anticlockwise, all the way around until it stops. The green light on the display should now go out, indicating that warmstart has been switched off. The hot water control knob will now need to be turned clockwise, until the desired temperature setting has been reached (but not turning all the way around to the end, as warmstart would be switched back on). You can read about warmstart for both the Vaillant ecoTEC Pro and ecoTEC Plus models in more depth, in the boiler’s “user instructions”, under the heading “Warmstart”. If you don’t have the user instructions for your Vaillant boiler, it may be possible to download these instructions online. Remember, people who would normally be looking for information on such things like, “How to use less gas” or “Tips on how to lower your fuel bills”, would probably not want to have their boilers Warmstart facility activated, due to the fact that they would then be burning more gas, than they actually needed to! A "Vaillant ecoTEC annual qualifying service" is needed at the end of the 1st, 2nd, 3rd, 4th and following years, in order to keep the boiler parts and labour warranty valid throughout the guarantee period. Can Glowcare provide this service? Yes we can, providing you live in the North West of England. ( Glowcare can be contacted on either 01244 880725 or 07789018775 or email info@glowcare.co.uk for the north-west of England area ). As approved Vaillant service engineers, many customers use us for their Vaillant boiler’s Annual Warranty Qualifying Service. This must be carried out each year, through the warranty period, to keep the boilers guarantee valid. The Vaillant boiler models that may be under a live warranty are: Vaillant ecoTEC pro 24, 28 & 30kW, Vaillant ecoTEC plus combi 824, 825, 831, 832, 835, 837, 838, & 937, Vaillant ecoTEC plus regular open vent 412, 415, 418, 430 & 435 boiler, Vaillant ecoTEC plus system 612, 615, 618, 624, 630 & 637 boiler, Vaillant ecoFIT pure combination boiler 825, 830 & 835, Vaillant ecoFIT pure regular 412, 415, 418, 425, 430 & 435 boiler, ecoTEC exclusive green iQ combi 35 & 43kW, Vaillant Home regular 12, 15, 18, 25 & 30 boiler, Vaillant Home Combi 25, 30 & 35 boiler, Vaillant home system 12, 15, 18 & 25 boiler. If you live elsewhere in the U.K., try searching with the same information that brought you to us, but with something like “Vaillant boiler repair or service near me”, or, you also might try putting in Vaillant Approved Service Engineer, and ( your town or city ), Vaillant Emergency Plumber ( your town or city ) or if you have a Glow-worm boiler, then Glow-worm Emergency Gas Service Engineer ( your town or city again. Adding your precise location, hopefully this will bring up details for a Vaillant specialist in your area. Glowcare are proud to be accredited Vaillant UK official approved service Engineers. We spend, almost all of our time getting as many Vaillant boilers repaired and serviced as we can. This is achieved by being City and Guilds time-served tradesmen, offering over 26 years experience, working independently in the gas central heating boiler repair industry, exclusively on Vaillant, Glow-worm and Saunier Duval boilers. We are Gas Safe Registered (formerly Corgi Registered) and are qualified to service and carry out repairs to, Faulty Glow worm 30 CXI boilers, problems on Vaillant ecoTEC Plus & Pro combi boilers, working on LPG boilers, as well as natural gas boilers. We are happy to show our customers our comprehensive list of qualifications on request. As for experience, well Glowcare are really set up to sort out and fix all f1, f3, f6, f9, f11, f12, f13, f14, f22, f25, f28, f29, f54, f61, f62, f63, f64, & f75 Fault error code problems. We even respond to Vaillant repair requests spelled incorrectly including vaillant, vaillant boiler, vaillant boilers, vailant boiler, vailant boilers, vallant boiler, valliant boilers repair and so on. Dont worry how you spell the word Vaillant, we’ll still come, promise. Our expertise and continued attendance on factory training programmes ensures we can carry-out repairs on faulty, broken or leaking ultra-modern high efficiency boilers. These latest models include: Glow-worm Ultracom, Flexicom and Betacom as well as Vaillant ecoTEC pro & plus and ecoMAX pro. Our work as approved manufacturer’s service agents for over 20 years, almost always guarantees that repairs to a customer’s boiler get completed in one single service call. All work and parts carry a one year guarantee. Glowcare are fully insured for up to £2,000,000 for Public Liability and have a £10,000,000 Employers Liability / Indemnity limit. What does a boiler service comprise of and how often should my boiler be serviced? Our boiler servicing involves a visual inspection, checking and testing the different boiler functions for correct and safe operation and cleaning out of dust and debris. See our Glowcare Boiler Service page for more details. The most important reason for a regular boiler service is for your safety. A faulty boiler could result in poisonous carbon monoxide leakage into your home (which can be fatal). For more information about carbon monoxide poisoning, including signs and symptoms, visit GasSafeRegister.co.uk. Your boiler will run far more efficiently when it has been regularly serviced, saving you money in the long-term and reducing emissions into the environment. We recommend that your boiler is serviced annually. Do you carry replacement parts with you that can resolve such PCB or Gas Valve issues on the Vaillant ecoTEC plus & pro boilers as Vaillant F61 fault code problems, Vaillant F62 fault error code failure, Vaillant boiler displaying F63 intermittently or F64 on Vaillant fault code showing & not working? Vaillant ecoTEC plus 824, 825, 831, 832, 835, 837, 838, 937 & 938 combi boilers, Vaillant ecoTEC pro 24, 28 & 30 combi boilers, Vaillant ecoTEC System 612, 615, 618, 624, 630 & 637 boilers, Vaillant ecoTEC Open Vent 412, 415, 418, 424, 428, 430, 435 & 438 boilers, Vaillant ecoTEC plus regular 12kW, 15kW, 18kW, 24kW, 30kW & 35kW open vent boilers, Vaillant ecoFIT pure 825, 830 & 835 combi boilers, Vaillant ecoFIT sustain 825, 830, 835 combi boilers. Parts for the Glow-worm Energy 25kW, 30kW & 35kW combi boilers, Glow-worm Ultimate 3 30kW & 35kW combi boilers, Glow-worm Easicom 3 24kW & 28kW combi boilers, Glow-worm Betacom 3, 24kW & 30kW combi boilers, Glow-worm Essential 24kW & 28kW combi boilers, Glow-worm Ultracom 24, 30 & 38 cxi High Efficiency Condensing Combination Boilers, Glow-worm Ultracom 2, 24, 30 & 38 cxi High Efficiency Condensing Combination Boilers, Glow-worm Ultracom 2, 24 & 30 cx High Efficiency Condensing combination Boilers, Glow-worm Ultracom 12, 15, 18, 24, 30 7 38 hxi, Glow-worm Ultracom 2, 12, 18 & 30 sxi, High Efficiency Condensing Boilers, Glow-worm Flexicom 24, 30 & 35 cx Condensing Boilers, Glow-worm Flexicom 12, 15, 18, 24, 30 & 35 hx High Efficiency Condensing Boilers, Glow-worm Ultracom 18 & 30 sxi Condensing Boilers, Glow-worm Ultimate 3, 30 & 35 High efficiency combi boilers from Glow-worm, Glow-worm Easicom 24 & 28 Boiler, Glow-worm Easicom 2, 24 & 28 combi boilers, Glow-worm Easicom 3, 24 & 28 combi boilers, Glow-worm Easicom 3, 25kW system boilers, Glow-worm Energy 25kW, 30kW & 35kW combi boilers, Glow-worm Energy 12kW,15kW, 18kW, 25kw & 30kW, Glow-worm Energy 12kW, 15kW, 18kW, 25kW & 30kW regular boilers, Glow-worm 24, 30 & 38 cxi High Efficiency Condensing Combination Boilers, Glow-worm 12, 15, 18, 24, 30 & 38 hxi High Efficiency Condensing Boilers, Glow-worm 18 & 30 sxi High Efficiency Condensing System Boilers. All parts fitted by Glowcare carry a one year guarantee, and we do not place an age limit on your boiler, for the repairs that we regularly carry out. We also try to ensure that we always carry as van stock, an adequate quantity of the most commonly used parts for repairs and breakdowns, that we feel are always in the greatest of demand. These very commonly used parts carried by Glowcare, are in the main for the latest Vaillant ecoTEC pro & plus boilers, and other listed Glow-worm boilers including: The Vaillant ecoTEC boiler Pressure Sensor 0020059717, for a F.75 fault code problem on plus & pro boilers, Vaillant ecoTEC PCB 0020132764, for Fault code error problems showing a F.27, F.61, F.62, F.63, F.64, F.65 or F.67 on plus & pro boilers, Vaillant ecoTEC PCB 0020254533 / 0020135165 for Fault code error faults displaying a F.27, F.61, F.62, F.63, F.64, F.65 or F.67 on plus & pro boilers, Vaillant ecoTEC Diverter valve 0020132682, (Brass type) on ecoTEC plus 825, 832, 835, 837, 838 937 & 938 plus & pro boilers, Vaillant ecoTEC Diverter valve 0020020015, (Plastic type) for ecoTEC pro 24, 28 & ecoTEC plus 824, 831, 832 & 835 boilers, Glow-worm cxi PCB 2000802731, for the cxi, hxi & sxi boilers with intermittent failure with a blank screen display, or with a fault code F1, F12, F13 or F14 boiler problem, Glow-worm cxi Fan 801645, for the cxi, hxi & sxi boiler failure, from a blank display screen or problem from fault codes F1 or F3, Vaillant ecoTEC plus Gas valve 0020148381, (from 2012), for ecoTEC plus 612, with Fault code F.28, F.29 or F.54 boiler failure, Vaillant ecoTEC plus Gas valve 0020148382, (from 2012) for ecoTEC plus 831& 832 with Fault code F.28, F.29 F.54 boiler failure, Vaillant ecoTEC plus Gas valve 0020148383, (from 2012) for ecoTEC plus 637, 837 & 937 with Fault code F.28, F.29 F.54 boiler failure, Vaillant ecoTEC plus & pro integral Grunfos pump 178983, with Fault code F.75 boiler failure, and Vaillant ecoTEC plus & pro boiler Expansion vessel 181051, with pressure dropping problems, 0.5 Flashing on boiler display or Fault code F.22 boiler failure. What do you mean by "fair pricing"? 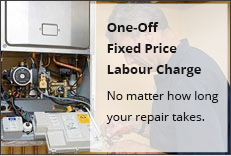 At Glowcare we only charge a one-off fixed labour price for diagnosing and fixing your boiler, however long the repair takes. This price also includes call-out. Should your boiler require a new part to get it up and running again this will obviously be extra, however we will always advise you of the cost of the part before the repair is started. If you smell gas we recommend that you immediately call National Gas Emergency Service on 0800 111 999 (England, Scotland and Wales). For LP Gas you will see the gas supplier’s emergency number on the bulk storage vessel or at the meter. Switch off the gas at the control valve to the appliance and at the mains (if you know where it is). Don’t create a flame and put out any naked flames. Contact a gas safe registered engineer to carry out necessary repairs. My town is not on your "Areas We Cover" page, can you list where you will travel to? We cover most areas in the North West, but for a comprehensive list of all areas that are covered by Glowcare, please visit our Postcodes and Areas Directory page. Our Vaillant boiler needs an urgent repair, it's stopped working and has broken down, it's been displaying fault code F.27, F.61, F.62, F.63, F.64, & F.75 ?, Can you help? *See the list below to identify your specific boiler model. As Vaillant’s official service agent for the North West of England, including Gt Manchester, Cheshire, Liverpool, Merseyside, Lancashire and North Wales and all local and rural surrounding areas. Glowcare treats all Vaillant boiler ugent repairs and breakdowns for customers as equal, attending urgently and as quickly as possible often the same day, on all Vaillant ecoTEC pro and Vaillant ecoTEC plus boiler with problems such as Vaillant F.27, F.28, F.29, F.54, F.61, F.62, F.63, F.64, F.65 & F.67 Fault error code issues, PCB, Gas valve and Water pressure sensor F.75 problems on the Vaillant ecoTEC pro 24, 28 & 30, Vaillant ecoTEC plus 824, 831, 832, 835, 837, 838 or 937, Vaillant ecoTEC plus 612, 615, 618, 624, 630, 637, 415, 418, 428, 438. Vaillant ecoTEC Exclusive 832, 838. Vaillant ecoTEC pure, Vaillant ecoTEC sustain, Vaillant Home combi 25, 30 &35, Vaillant Home system 12, 15, 18 & 25, Vaillant ecoMAX Pro VU 186.0, VU 286.0. Vaillant ecoMAX 613/2, 618/2, 622/2, 635E, 824/2E, 835E. Vaillant TURBOmax pro 24 E, 28 E, TURBOmax plus 824 E, 828 E, VUW242/2-5 R1…R3. Is your boiler displaying a any of the following fault codes on a Glow-worm 24, 30, or 38 CXI, HXI or SXI or Glow-worm Ultracom boiler with a: F1, F2, F3, F4, F5, F6, F7, F8, F9, F10, F11, F12, F13, F14, F15, F16, F17, F18, F19, F20, F21, F22, F23, F24, F25, F26, F27, F28 etc. Saunier Duval: 01, 05, 0.5, 21, F1, F2, F3, F4, F5. Vaillant: F0, F1, F10, F11, F13, F20, F22, F23, F24, F25, F27, F28, F29, F32, F37, F42, F43, F49, F60, F61, F62, F63, F64, F65, F67, F70, F71, F73, F74, F75, F76, F78. Fault codes can appear when the boiler has experienced, e.g. “low system pressure”, “electrical supply failure” or “no gas to the appliance”. With the boiler manual to hand, you can check the specific “F” code to identify its meaning, then try to reset the boiler. This may well rectify the problem. However, you may have tried this and found that the “F” code returns. This may indicate a more complicated boiler fault or breakdown that you will not be able to fix yourself. If this is the case then you will need an experienced Gas Safe engineer to attend and repair. Glowcare are Vaillant UK’s approved specialists for Vaillant & Glow-worm gas boilers in the North West of England. We deal with all common faults that occur including Glow-worm 30 CXI problems F.11, F.12 PCB fault, F.13 PCB failure, F.14 PCB problems, Leaking boiler Diverter Valve, Faulty boiler pressure sensor, Glow worm blank display screen We can be contacted on 01244 880 725 / 07789 018 775 / email info@glowcare.co.uk to arrange a service call. * Glow-worm 24 CXI, 30 CXI, 38 CXI, Glow-worm 12 HXI, 15 HXI, 18 HXI, 24 HXI, 30 HXI, 38 HXI, Glow-worm 18 SXI, 30 SXI, Glow-worm 12 CI, 15 CI, 18 CI, 24 CI, 30 CI, 38 CI, Glow-worm Flexicom 24 CX, 30 CX, Glow-worm Flexicom 12 HX, 15 HX, 18 HX, 24 HX, 30 HX, Glow-worm Flexicom 18 SX, 30 SX, Glow-worm Ultracom 24 CX, 30 CX, Glow-worm Ultracom 24 CXI, 30 CXI, 38 CXI, Glow-worm Ultracom 12 HXI, 15 HXI, 18 HXI, 24 HXI, 30 HXI, 38 HXI, Glow-worm Ultracom 18 SXI, 30 SXI, Glow-worm Ultrapower 100, Ultrapower 170, Glow-worm Ultracom2 24 CXI, Ultracom2 30 CXI, Ultracom2 35 CXI, “British Gas”, BG 330, 330 Plus, Glow-worm Xtramax HE and Glow-worm XTRAFAST High Efficiency Condensing Boilers. * Saunier Duval Thema Condens F24E, F30E. Saunier Duval Condens F24E, F30E. Saunier Duval ISO Fast Condens F35E, Saunier Duval XEON Condens F18E, F30E. Saunier Duval Thema Plus Condens F30E. Saunier Duval Enviro Plus F24E, F28E. Saunier Duval Thema Classic 24E, 30E, 35E. Saunier Duval ISO Max F28E. Saunier Duval ISO Fast F28E, F30E. Saunier Duval Protherm 80E, 100E. Saunier Duval Jaguar 80E, 100E. Saunier Duval Icon 24T, 28T. Our aim on this website (www.glowcare.co.uk) is to provide homeowners and private landlords with advice that is as reliable and helpful as we can. However, please note that this is guidance only. It does not necessarily deal with all important topics or cover all aspects of the topics with which it deals, and may not be relevant or appropriate in all circumstances. Its purpose is not to provide professional advice and therefore should not be relied on as such. If you are in any doubt, you should always consult an appropriately qualified expert for specific advice before acting on any of the information contained on this website. At no time should you attempt to carry out any activity which may put you or anyone else at risk, or which may cause damage to your property or anyone else’s property. The activities described should not be attempted by anyone who is under the age of 18, or inexperienced. Some activities such as those that involve gas or electricity should only be carried out by qualified professionals. Always read and follow relevant manuals and safety instructions. Also, if you have insurance cover, you should check that your cover is not invalidated by undertaking any work yourself.